Kids will get to operate on a “much more humane schedule,” one teacher says. Seattle Public Schools will be pushing back school start times for older students in the coming school year. In November 2015, the Seattle School Board voted to delay school start times for high school students so they could get more sleep. At the time, board leaders called it a “historic moment” designed to prioritize student health over district logistics. The change made Seattle one of the largest districts in the country to delay school start times for teenagers. Now, before classes resume in September, administrators, teachers and parents are preparing to implement some hard changes for the greater good of students. All of the district high schools and most middle schools will be starting later than in the past, at 8:45 a.m., while many elementary schools will be starting earlier, at 7:55 a.m. A few elementary and K-8 schools will start at 9:35 a.m. Experts say that delaying school start times can benefit student health. Over 90 percent of high school students are chronically sleep-deprived, according to a 2014 report. This can have a severe impact on their physical and emotional health: Tired teens are more likely to be overweight, anxious and get poor grades. 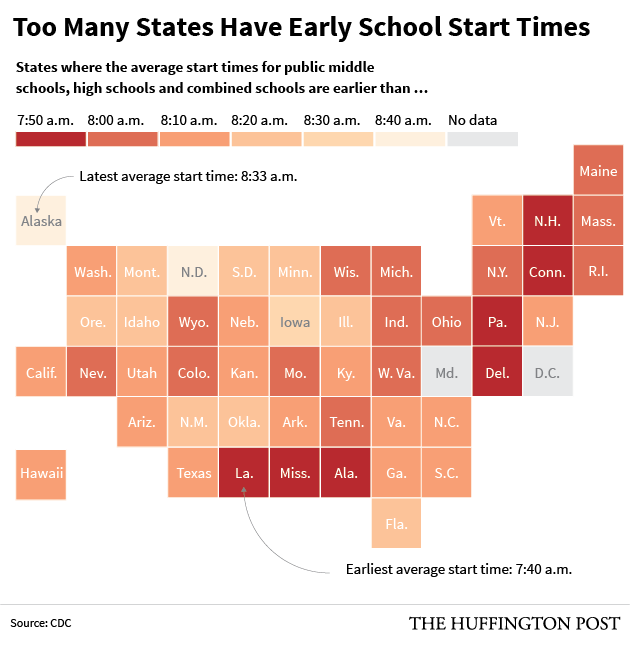 The American Academy of Pediatrics recommends that middle and high schools start at 8:30 a.m. or later. Yet less than 1 in 5 of those schools do so, according to a Centers for Disease Control and Prevention analysis of Education Department statistics. The movement to delay school start times in Seattle began years ago, says Cindy Jatul, a high school biology and biotech teacher in the district. Jatul, former community nurse practitioner, began advocating for delayed school start times in 2012, after she began to notice intense signs of sleep deprivation in her students and her adolescent daughter. With a group of other teachers, health experts and community leaders, she developed a coalition to push the matter. The district subsequently formed a task force to look at the feasibility of changing school schedules, and the board eventually voted on the change. Dr. Maida Chen, director of the children’s sleep disorders program at Seattle Children’s Hospital, is one of the health experts who was in favor of the changes. “Making this change ... was the best change to make for the benefits of our children’s health, safety and learning,” she added. Still, Jatul says that community reaction to the changes have been mixed. Some parents of younger children are now scrambling to find child care because their kids are getting out of school earlier. A recent HuffPost/YouGov poll found that delayed school start times might not be a priority issue for most parents. The national poll found that 57 percent of parents with children under the age of 18 think their kids get enough sleep. Over 40 percent of the parents polled said they thought their children’s schools started at around the right time. In Seattle, there has also been some resistance from leaders of after-school programs, like sports coaches. High school students will be getting out later, and several schools don’t have lit fields for when it gets dark outside, Jatul said. CORRECTION: A previous version of this story said most elementary schools will start at 7:45 a.m. It is 7:55 a.m. The HuffPost/YouGov poll consisted of 1,000 completed interviews conducted Aug. 8-11 among U.S. adults, using a sample selected from YouGov’s opt-in online panel to match the demographics and other characteristics of the adult U.S. population.